Walter Rustmann, D.O. is board-certified by the American Board of Internal Medicine with sub-specialty certifications in Pulmonary Disease and Critical Care Medicine. Before joining White-Wilson Medical Center, he served in the Navy, Army, Air Force AND the Marines for more than 37 years. Dr. Rustmann received his doctor of osteopathic medicine degree at the Des Moines University of College of Osteopathic Medicine in Des Moines, IA. During his time in the Navy, Dr. Rustmann worked as a physician in the ICU. During his time in the Air Force, he was stationed at the South Pole as a Senior Medical Officer. Dr. Rustmann specializes in Pulmonary, Critical Care, Sleep Medicine at White-Wilson's Pulmonology Clinic in Fort Walton Beach. 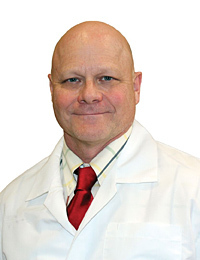 In his spare time, Dr. Rustmann enjoys spending time with his wife, two children and young granddaughter. Dr. Rustmann is passionate about helping patients with pulmonary and sleep medicine issues. When he is not in the clinic, he enjoys the relaxed lifestyle of the Emerald Coast with his family.